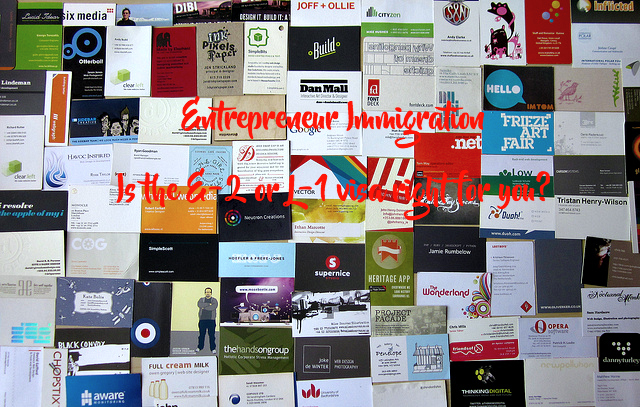 Entrepreneur Immigration: Is the E-2 visa or L-1 visa right for you? If you are a foreign entrepreneur, you have probably discovered that the United States immigration system is very limited in that there are very few visa options available to entrepreneurs that do not tie down the entrepreneur to a foreign employer, as is the case for the L and H visas. To make matters worse, if your ultimate goal is to obtain a green card to live and work in the United States permanently, you must work for an American employer willing to sponsor your adjustment of status. Although there are few exceptions, the main avenue through which entrepreneurs can gain permanent residence is either through family-sponsorship or employment-based sponsorship. To obtain permanent residence through an employer you must either a) be a professional employed by a U.S. employer willing to sponsor your green card b) demonstrate extraordinary ability in your industry (science, arts, education, business, or athletics, c) work in a management or executive position abroad requiring international transfer to the United States or d) qualify as an EB-5 investor. In either of these cases, the U.S. employer must submit the I-140 Immigrant Petition for Alien Worker for you, before you can apply for permanent residence. If your ultimate goal is not to obtain a green card, then you have more options available to you. We decided to write about this topic because we have found that many entrepreneurs that visit our office are not well-informed on other visa types that put them on a more direct path to permanent residence. Often times the topic of conversation leads to the E-2 Treaty trader visa, by far the most discussed visa type among entrepreneurs. Few entrepreneurs however have heard about the L-1 visa classification, that may in some ways be more beneficial to foreign entrepreneurs wishing to live and work in the United States permanently. Below we discuss both visa types and the advantages and disadvantages of both visas. Without a doubt, the most popular visa option entrepreneurs ask about is the E-2 visa. Many entrepreneurs however do not know that the E-2 visa is not available to everyone, and it is not a path to permanent residence. The E-2 visa is a non-immigrant treaty investor visa that is only available to foreign nationals from specific treaty countries. The E-2 visa allows foreign nationals to carry out investment and trade activities, after making a substantial investment in a U.S. business that the foreign national will control and direct. E-2 visa investors can either purchase an existing U.S. business or start a new business. Who is the E-2 visa ideal for? What are the advantages of the E-2 visa? Dependent children of treaty traders are not eligible for employment authorization in the United States, but may attend school. What are the disadvantages of the E-2 visa? The investment must be real and active and the enterprise must be a real operating commercial enterprise or active entrepreneurial undertaking producing a service or offering a commodity. Applicants must demonstrate that the business is successful, creating jobs for Americans, and stimulating the economy to remain in the United States and seek future extensions. Entrepreneurs rarely discuss the L-1 visa, but it is a very good option for entrepreneurs who wish to remain in the United States for a longer period of time and are ultimately interested in applying for permanent residence. The L-1 visa is a nonimmigrant visa classification suitable for foreign nationals who are working in an executive or managerial capacity for a foreign company abroad, and are interested in coming to the United States to either work for or set up a subsidiary or parent company in the United States. There are 2 subdivisions of the L-1 visa category 1) L-1A Intracompany Transferee Executive or Manager and 2) L-1B Intracompany Transferee Specialized Knowledge. Who is the L-1 ideal for? The L-1A visa classification allows an existing foreign company to transfer an executive or manager to work for the U.S. subsidiary or parent company. If an affiliated U.S. subsidiary or parent company does not yet exist in the United States, the L-1A classification allows the foreign company to send the executive or manager to the United States for the purpose of establishing the affiliated subsidiary or parent company. The L-1A is beneficial to entrepreneurs who have already established a foreign company abroad, and would like to expand their company be either creating an affiliated U.S. subsidiary of the foreign company, or a parent company in the United States. The entrepreneur may then come to the United States in order to establish said subsidiary or parent company using the L-1A visa. Both the L-1A and L-1B require the applicant to have worked abroad for the foreign company for at least one year within the proceeding three years. If the ‘transferee’ is not employed in an executive or managerial capacity, the L-1B visa classification comes into play. In order for the ‘transferee’ to be eligible, the foreign company must demonstrate that though the transferee is not employed in an executive or managerial capacity with the company, they possess specialized knowledge and can represent the organization’s interests (L-1B). What are the advantages of the L-1 visa? Spouses of L-1 principal visa holders may seek employment authorization in the United States. What are the disadvantages of the L-1 visa? The foreign company/qualified organization must either currently be doing viable business or demonstrate that they will conduct viable business in the United States and at least one other country for the duration of the beneficiary’s stay in the L-1 visa classification. Ask yourself what is your goal, what do you want to ultimately achieve by obtaining either visa? Do you want to live and work permanently in the United States or temporarily? In summary, if you are the owner of a foreign company and are looking to expand your current business, then the L-1A visa will be the most suitable for you, since it will allow you to travel to the United States as a company ‘transferee’ for the purpose of opening an affiliated/subsidiary company in the United States. The L-1A also offers entrepreneurs a long term solution to remaining in the United States permanently. If you are you looking to start a completely new business or invest in an existing business in the United States, and you are not interesting in living and working in the United States permanently, then the E-2 visa option will be your best option. At the outset, the requirements for both visa types may seem difficult to satisfy, however they can be overcome so long as you can prove that you have the financial ability to invest in a business, and show records of an existing thriving business in your home country. Although the E-2 visa application process is generally an ‘easier’ process when compared to the L-1A application process, once the applicant has gone through the necessary steps of setting up the business in the United States (registering the business, providing proof of sufficient funds, and demonstrating that the funds are not ‘ill-gotten’) the remaining steps are straightforward. The important thing to remember here is that the E-2 visa does not offer a path to permanent residency, while the L-1A does. Finally, what should you look for when choosing a visa? First and foremost, make a clear assessment of your current situation – which of the above mentioned scenarios works best for you? Check if your country has any limitations concerning the type of visa type you are interested in by clicking here. Once you have completed these steps, contact an attorney to help you navigate the immigration process. For more information on the E-2 and L-1A visa types please visit our website.